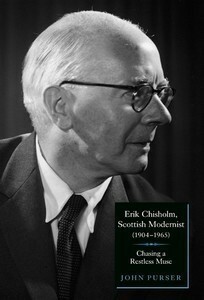 Erik Chisholm, Scottish Modernist (1904-1965) - Chasing A Restless Muse, was published by Boydell & Brewer in 2009, with the financial support of the Birmingham Conservatoire (University of Central England) and the Erik Chisholm Trust. “John Purser’s biography is written with great affection for Chisholm the man and musician. He takes us on an exciting journey from his early Scottish and Pibroch- influenced works to his Hindustani influences, his interests in Russian music and his vital essays in modernism. Chisholm’s restless nature and his extraordinary passion and originality, is truly captured in a biography of great quality.” Sir Charles MacKerras, Foreword to Erik Chisholm Scottish Modernist. was Erik Chisholm.” John Robert Brown, In: Classical Music, July 2009. “This admirable biography . . .” Malcolm Troup, Piano Journal, Issue 90 2010.
enriched the musical history of the 20th-century, providing another important piece of the puzzle and laying the foundations for further investigations.” Jürgen Schaawächter, Die Musikforschung Vol.64 Pt.1, Jan-March 2011. “Purser’s biography is a fascinating study, not only of the man himself, but also provides entertaining and easy-to-read analyses of his major works. This is an extremely important book, as it gives material witness to a significant twentieth-century composer, and John Purser’s prose style makes Chisholm’s vitality, imagination and energy jump off the page, making turning the page a real pleasure.” Michael Tuffin on “Book Choice” Fine Music Radio, Cape Town August 2nd 2010. “Chisholm’s contribution has been crying out for this reassessment – that it’s as readable as this is a real bonus.” Anon, “Book Reviews in Brief” ,The Scotsman 18.7.2009. “ . . a comprehensive study of the composer and his music . . . The structure of Purser’s book is a model for future studies. He writes a basically chronological text, but not quite. He intersperses the biographical flow with chapters on various important aspects of Chisholm’s musical activities and influences and friendships . . . this is a superb publication. It is a massive investigation into the life and music of one of Scotland’s great, but massively underrated composers. It will provide the biographical and musical reference material for all interested parties for years to come . . . This is a book that can be read cover to cover, or can be used as a source book . . . a book that looks good and certainly feels good. The text is printed on high quality paper in a font that is clear and easy to read. The book is well illustrated, with a large number of musical examples, a fine collection of line drawings and a good selection of black and white and colour photographs. The style of the writing is readable without in any sense failing to uphold the highest of scholarly standards . . . for scholars and writers who are interested in this composer or the period of his activity, it is an essential purchase.” John France “Erik Chisholm, Scottish Modernist 1904-1965 . . .” In: British Music Society News 124, December 2009.